Featuring a range of tools and comprehensive data sets, the Rambus Card Management System (CMS), including technology from Ecebs, acts as a gateway for transport operators and local authorities to access real-time information on their smart transport scheme including customer records, detailed purchase and journey information, and smart card data. The Rambus CMS is back-office software for managing the smart card or smart media lifecycle and smart media applications. The CMS supports registration, verification, card issuance, profile and card data management, card lifecycle management, and administration and reporting. Customizable for specific smart transport scheme requirements, the CMS features a configurable registration facility for new account creation and the ability to format information and validation to best suit the needs of the scheme. In addition, the CMS supports a number of models for card issuance, from local issuance of cards from a connected card printer, to sending requests to a card bureau, giving you the flexibility to get smartcards to your customers in a way that suits your business processes. The CMS is used to manage customers and cards for a smart-scheme, enabling registration and management of customers, application, approval and issuance of cards, and issuance and management of the applications available on a card. A Customer Service Representative (CSR) for the scheme primarily operates the CMS, often in a call centre responding to customer calls, or otherwise managing customer applications. For transport operators seeking to modernize their fare systems, HCE mobile ticketing solutions, which are compatible with existing ITSO-based infrastructure, offer the same ‘shopper friendly’ convenience consumers have come to expect from their smartphones in a transport environment, as it effectively replaces yet another plastic smart card with a secure digital travel wallet. Functioning as an add-on to the CMS, the Rambus Web Retail Solution (WRS) provides an online portal for travelers, giving them direct access to the smart transport scheme to manage their profile and cards, purchase tickets and top-ups and have them delivered directly to their smart card. By adding this self-service capability, transport operators can minimize support queries and improve the user experience for their customers. Built on a foundation of privacy by design, the CMS is fully GDPR compliant. The system provides a range of services and tools to help smart transport schemes in their efforts to keep passenger personal data safe and to give passengers control over their stored data stored. The CMS is hosted within a state-of-the-art hosting environment designed to meet the performance demands of smart ticketing deployments, including Software as a Service (SaaS) for transport operators and authorities. This keeps all passenger data within the United Kingdom, helping to support GDPR and other compliance demands. 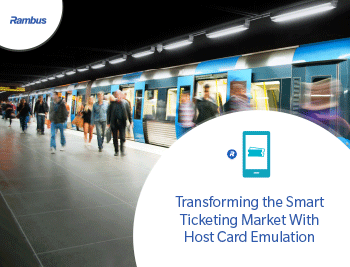 Read more about Smart Ticketing Hosting here. Despite the popularity of physical smart cards, the smart ticketing space is steadily evolving as transport operators introduce new payment and travel options for NFC-enabled smartphones. HCE, which offers the same ‘shopper-friendly’ experience consumers have come to expect from their smartphones in a retail environment, is a key driver of mobile technology in the public transportation sector.